Proving once again that a little knowledge is a dangerous thing, Bloomberg / Businessweek reporter Kyle Stock beclowns himself by pretending to understand financial ratios. Forget the door-busters, coupons, and “friends and family” deals. U.S. shoppers on the whole will be paying more over the next few weeks than they do the rest of the year. 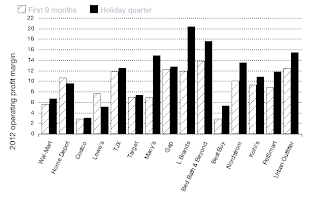 Turns out, retail profit margins tend to be higher during the holiday period, despite all the promotions. Among the 15 largest U.S. retailers, operating margins in the holiday quarter last year were 11 percent, compared with 9 percent in the preceding nine months. Amid the year-end shopping frenzy, these companies padded their bottom lines, on average, by roughly one-quarter. Wrong, moron. Higher holiday season operating margins do not mean shoppers are paying higher prices. Kyle Stock doesn't understand the difference between gross margins and operating margins. Gross margins are what Kyle should be looking at, the markup from cost of goods sold to the price charged to the customer. Operating margins include all operating expenses, including wages, store leases, and corporate overhead. Operating margins can increase for a number of reasons, including higher sales. If the company increases sales over which to spread the fixed costs, operating margins increase. Did Kyle ever consider that sales might increase for some stores during the holidays? Home Depot (HD) and Lowe’s (LOW) may be the only places where a shopper can expect to catch an honest break at the end of the year. Macy’s (M), Bed Bath & Beyond (BBBY), and L Brands (LTD), the company behind Victoria’s Secret, are particularly adept at producing opulent holiday returns. Obviously, Home Depot and Lowe's have different seasonal trends than clothing stores, being more related to home and garden work and less related to drywall under the Christmas tree. If Kyle had bothered to take even a cursory look at the financials, he'd notice that gross margins for the two stores are fairly steady throughout the year, but operating margins are lower in winter because of lower seasonal sales. Some stores, like Bed Bath & Beyond and L Brands, do have higher gross margins in the holiday season. Macy's gross margins, on the other hand, are highest in summer. But the seasonal differences in gross margins are small relative to the differences in operating margins, which are explained by large holiday sales volumes. Not everyone understands the basics of financial statements. But for someone who is paid to write about this stuff for an alleged business publication to be this ignorant is truly stunning. The degree of economic illiteracy demonstrated by "reporters" is amazing and gets worse every year. Many cannot distinguish total sales from net profit. Welcome to the real world. Good thing you trained one of the best and brightest in the accounting media yourself then, huh IA? I'll be at the SEC/PCAOB conference next week in DC, let me know now if you want me to say hello to anyone. First rate analysis. Well done Varones! !